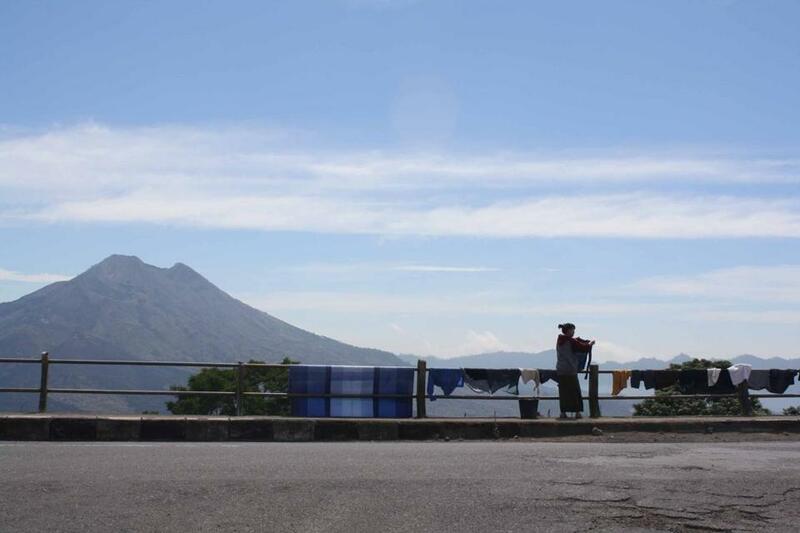 A woman dries clothes along the road to Mount Batur. The volcano is in the background. KINTAMANI, Bali — On the road to Mount Batur, our driver snaked past jade rice terraces that descended into palm-filled valleys. Men worked in front of shops and homes, bending penjors — long, decorative bamboo poles that dangle festive offerings over the asphalt, a tribute to the gods and a symbol of the mountain. When we reached Batur, an active volcano, I asked him to drive past the guide station. Every hike my wife and I had taken in Southeast Asia required a guide. I was tired of being chaperoned. I had read that guides were not mandatory at Batur (though they’re nearly essential if you’re planning a predawn trek to the peak) but that they won’t let you ascend without hiring one. 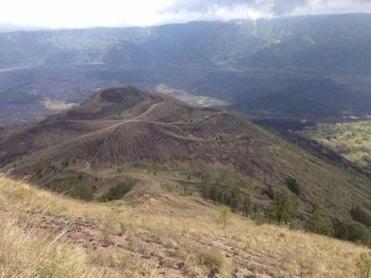 A view from Mount Batur’s top, looking toward the new craters and the charred land. As we drove past the station three men jumped on motorbikes and chased us. They stopped our vehicle and spoke with our driver. “They say that the only way to climb the volcano is back there,” our driver said, so we drove back. At the Association of Mount Batur Trekking Guides building, 10 men approached. The largest, an angry six-footer named Eros, demanded that we enter his office. Things to keep in mind when planning a trip to Bali. “We’re looking to hike the volcano on our own,” I said. “I hope you’re not trying to break our rule, or else you’ll have a big problem,” he replied. On cue, his fellow guides glared at us. We paid the fee, about $31, for an attendant to accompany us to the peak, where we would be able to gaze down into the oldest and largest of the craters, which had last erupted in 1849. For an additional fee, we could hike to the new craters. When we declined to pay more, Eros said we could change our minds at the summit. Our guide Made, (pronounced Ma-day), 25, wore dark track pants and a sweatshirt while hiking under the intense sun. I could feel the heat from the black sand around my ankles each time I plunged a foot into the loose earth. The path through the grasses, which meandered past dried up pumpkin patches and small cornfields, was clearly defined. “Why do we need a guide?” I asked Made. “In case of eruption,” he said. He didn’t answer, not speaking again until we came to a Hindu temple partway up the arid slope. The entrance was flanked by one yellow and one white umbrella. To the west, the land had been blackened by a 20th-century eruption that wiped out the village below. One fertile island sprouted from the charred plain. Batur itself looked like a jigsaw puzzle: dark igneous rock clasped thousands of patches of green vegetation. Hardened lava clinked beneath our feet. Before reaching the peak, we came to the mouth of the oldest crater, a 200-meter pit mostly coated in vegetation and filled with stones that had crumbled from its western side. Though smoke spilled from a few cracks, the fertile pit and unadulterated hues in the cliff didn’t match images of volcanic land. “When will it erupt next?” my wife said. Made placed his hand near a small hole at the top of the crater — a geothermal 50-degree-Celsius oven where tourists come to slow-cook eggs and bananas. “Today I don’t think so,” he said. Grey monkeys roamed the perimeter and birds swooped about. “What kind of monkeys are those?” I said. A French couple was peering into the crater. They had skirted the guides, parking their motorbike in a lot near Toya Bungkah village, and found a trailhead adjacent to a hot spring. “These are first people I see without guide,” Made said after interrogating them. At the peak, Made offered to extend our tour to the 20th-century craters, which last erupted beginning in March 1999 and had continued a few months into the millennium. The extension was worth the additional $10. The views along the far side of the mountain offered a stunning landscape that lost vibrancy as the earth neared Batur. We walked along the narrow rim and through the smoke wafting from the crater. Made was like a mountain goat, running along the rim and sprinting down the loose slope. The new craters were quite different from the vegetative giant that last spewed in 1849. These holes fit the image of volcanic land: Dark black pits had sprayed a scattering of purple rocks and painted lines of red into the gray earth. In the distance we saw what Made called the Lucky Temple, one of the few buildings to have survived the eruption. As we began our descent, I worried that Eros would catch wind of our deception. When I paid Made, I wondered if this were part of a well-rehearsed scam and we would be forced to pay again in the parking lot. Our driver sped away, not waiting for us to respond. Noah Lederman can be reached at www.somewhereorbust.com.